A new addition to the best-selling series, for the burgeoning over 50 population. Studies abound confirming what we all know: use it or lose it. Exercise of any kind has a profound positive effect on health, longevity, disease prevention and a sense of well-being. The exercises in Anatomy of Exercise for 50+ will support good health at any age, but for those over fifty they can help in the prevention of age-related problems like joint mobility, balance and fatigue, as well as medical conditions like heart disease, colon cancer, diabetes, osteoporosis, arthritis and Alzheimer's. 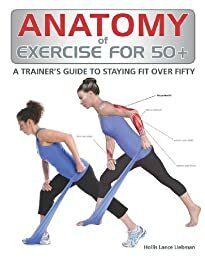 Anatomy of Exercise for 50+ follows the successful format of the "Anatomy of" books--Anatomy of Exercise, Anatomy of Muscle Building, Anatomy of Yoga--which have together sold more than 100,000 copies. Their revolutionary approach is the combination of photographs and lifelike anatomical drawings that reveal in colorful detail exactly which muscles are engaged and benefitting from each exercise. Those who want to take control of their health (at whatever age), fitness trainers, physiotherapists, and activity managers in community care facilities, retirement homes and nursing homes will find Anatomy of Exercise for 50+ an instructive and practical resource.